The price of silver soared over the last three months, but that momentum has paused. In early December, silver prices traded all the way down to $13.65, then began a robust climb that recently took silver futures past $16 intraday. That's a 17% gain in just three months. 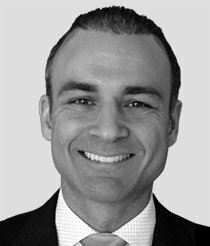 And while the silver price's gains have been impressive, there are three indicators that point to more gains for silver ahead. Silver prices kicked off last week with little movement. 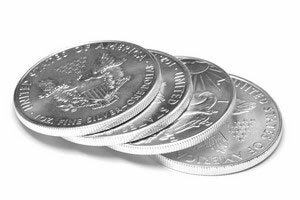 On Monday, March 21, silver futures for May delivery opened at $15.82 and remained flat throughout the day. The silver price closed at $15.85. On Tuesday, the price of silver received an early-morning bounce due to the Brussels terror attacks. But the bounce quickly faded and futures fell 0.3% to close at $15.86. The silver price kept falling from there. After seeing a 2.4% drop on Wednesday, prices slid again on Thursday, closing at $15.20 and logging a 4% loss for the short trading week. In my view, the price of silver has shared some of the same drivers as gold prices in the past week, but there are some others at play. Silver prices have declined about 6% from their recent peak, whereas gold prices have given back about 5.2%. Normally, we'd expect silver to outpace gold on both the up and downside thanks to its notorious volatility. But the silver price has seen more gains than usual, since it's fallen roughly 30% more than gold since peaking in 2011. Not to mention it has yet to catch up to gold since bottoming at $13.65 in December. 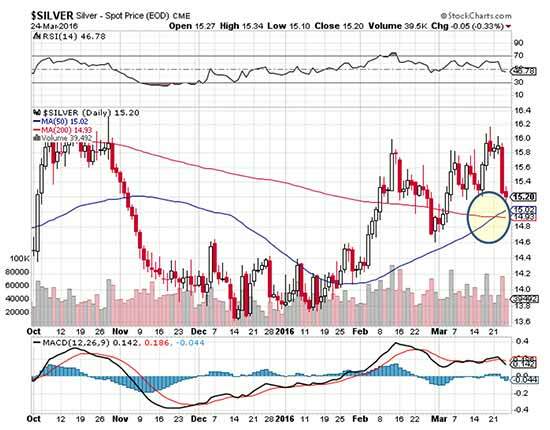 Just two weeks ago, I highlighted the fact that silver was quickly approaching its bullish "golden cross" moment. In the chart above, the 50-day moving average for silver prices crosses above the 200-day moving average. I've circled that point above. So that's certainly a bullish sign for the future of silver prices. Recently, both the RSI and MACD have turned lower, so we could see a bit more weakness in the near term. The second bullish indicator for silver prices is sales of physical silver. Notably, Chinese imports have been breaking records. Thanks to concerns about possible currency devaluations, the Chinese are buying silver at a breakneck pace to seek shelter for their capital. Jewelry demand has also continued to run higher. And remember, China accounts for a whopping 20% of global silver demand. The third bullish factor is silver's use in solar panels, which helped push Chinese imports to a massive 3,400 tons in December. That helped make 2015 the best year since 2011. And since the start of 2016, silver exchange-traded fund (ETF) inflows have reached some 474 metric tons, nearly reversing the entire outflow of 2015 in less than three months. So as we contemplate what's likely a temporary soft patch in the price of silver, the bigger picture continues to look bullish. Stay tuned to Money Morning for more updates on the price of silver's long-term rebound. Follow us on Facebook and Twitter.